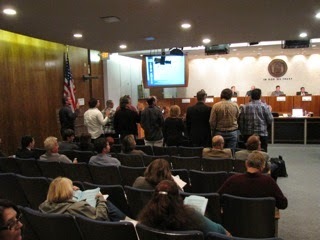 At the Costa Mesa Planning Commission meeting that lasted seven hours and fifteen minutes last night, four hours and fifteen minutes were spent on one issue alone - the request from Yellowstone Recovery for a "Reasonable Accommodation" for their facility at 3132 Boston Way. More on that in a minute. Chairman Jim Fitzpatrick pulled Item #2 from the Consent Calendar for discussion, so Consultant Staffer Jerry Guarrancino provided a short report on several items previously requested by the Planning Commission. They included a report on the Smartphone app, Costa Mesa Connect; Nuisance Abatement Ordinance, Sober Living Ordinances for R2 and R3 Zones and Motel Inspection Data. You can read all the numbers in the staff report, HERE. Resident, former councilman and recent council candidate Jay Humphrey - who remains engaged in municipal activities - pulled Item #3, the SOBECA Traffic and Parking study, for discussion. Actually, he wanted to express appreciation for the information, but bemoaned the lack of similar studies for other vital parts of the City - the Westside and Eastside, for example. The first Public Hearing, on a Scooter Sales Store, was taken off the calendar and will be re-noticed if it is ever brought back. Then, at 6:40 p.m., came the elephant in the room - Public Hearing Item #2, the request for Reasonable Accommodation by Yellowstone Recovery for their facility at 3132 Boston Way. 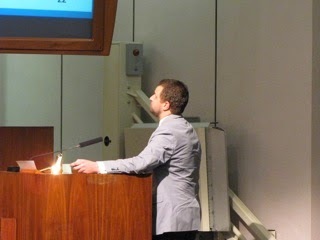 The staff recommendation was to uphold the denial of the request by resolution. Four hours and fifteen minutes later, including breaks, the commission voted to uphold the denial. 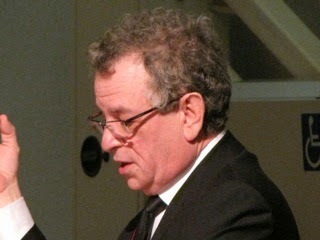 During the hearing - which was conducted more like a trial than a normal hearing, including having many of the speakers sworn-in - the lawyer (Steven Polin) for the appellant (Yellowstone Recovery) presented his "case" for approval of the appeal and, thus, permit Yellowstone to continue to operate a sober living home with 15 residents at 3132 Boston Way. The maximum permitted is 6. Before it began, though, Polin suggested that Commissioner Timothy Sesler had a conflict because he was part of a team put together by then-mayor Jim Righeimer to evaluate the Newport Beach sober living situation and Yellowstone had been part of that discussion. He indicated that Sesler should recuse himself. That prompted a short break while Deputy City Attorney Yolanda Summerhill consulted with Sesler. The result was that Sesler - also a lawyer - felt he could be an objective and fair participant and the commissioners agreed. 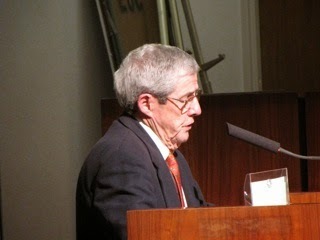 He stayed on the dais. 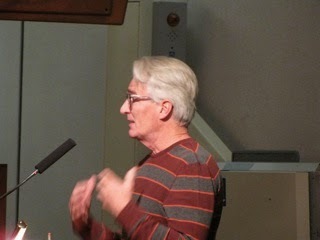 Polin's presentation, in which he attempted to convince the commissioners that Yellowstone perhaps should be "grandfathered-in", included short speeches by a dozen current and former residents of the recovery home, plus two other supporters of the program - resident Grant McNiff (shown) and Richard Dumont of the Recovery Network. The comments by the recovered and recovering addicts were quite moving in many cases. Each was sworn-in by the clerk before they spoke. Based on the body language of the crowd and reaction and comments by the commissioners, there were few unsympathetic people in the auditorium last night. 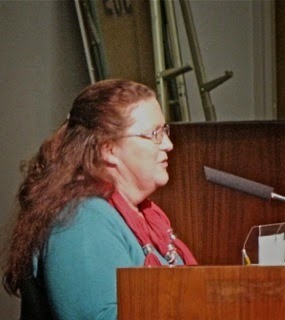 Owner of the home, "Honey" Thames, stepped up to address the commission to convince them of the value of the operation, and the value of having more than 6 residents at the site. She failed to do so. 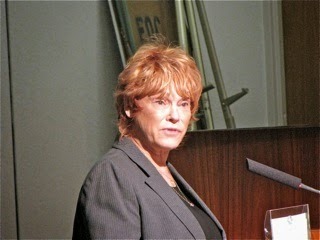 Elena Gerli led the presentation by the City Staff. 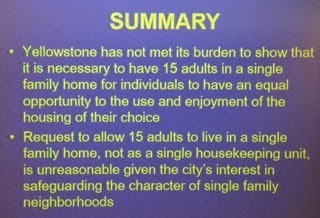 She presented a lengthy slide show, outlining the elements of the issue. 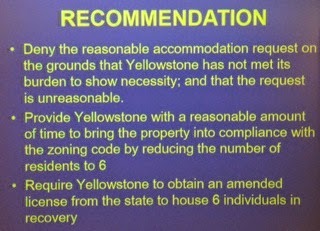 She outlined the law, and described the request by Yellowstone. 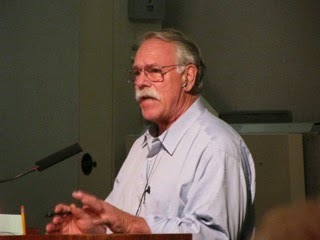 Those slides are shown here. 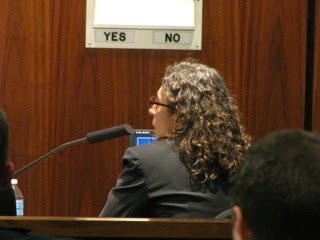 Additionally, the City also presented testimony by Patricia Shields, a lawyer, recovering addict and consultant, who apparently was being paid $2,500 by the City for consultative support on this issue. She, in response to questions by Greg Palmer of the City Attorney's office, established her credentials, gave a work history and then provided an assessment of the situation. 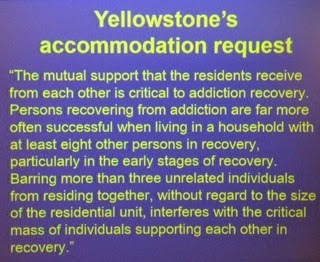 The short version is that she, and other highly qualified persons who provided opinions, felt there was nothing demonstrated by Yellowstone that having 15 persons in a recovery home was necessary to the recovery when compared to the permitted 6 residents. Code Enforcement officer Mike Tucker also aided in the presentation by providing a history of this home, which apparently dates back fifteen years at that site. He discussed the history of calls for service at the site, including the most recent one which resulted in this action when a resident apparently jumped off the roof of the building into the swimming pool. In addition, several members of the public, including some from the neighborhood in which the house is located, spoke to address the issue. 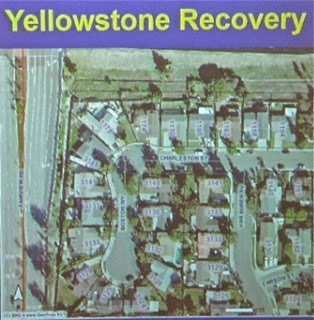 It turns out that the Yellowstone Recovery home is but one of four (or five-it was unclear) additional similar facilities close to it. 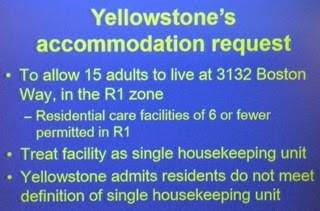 After all was said and done, and following what certainly sounded like a threat of legal action by Polin near the end which upset at least one member of the commission - Colin McCarthy - the commission voted to uphold the denial of the request for Reasonable Accommodation and directed staff to work with Yellowstone to come up with a transition plan for the reduction of residents in the facility. I suspect nobody left in the room expected that was going to go smoothly, but the commission gave the staff one month to work out a plan. SADDLEBACK CHURCH AT 1901 NEWPORT BLVD. Finally, at 10:55, the commission took a short break before moving to the next item and reconvened at 11:05 to discuss the proposal from Saddleback Church to occupy several spaces at the building at 1901 Newport Boulevard. This issue has come before the commission previously and the last time was sent back for more work on a traffic and parking plan. It turns out that was a good idea, because several issues were uncovered - like a shared parking arrangement with The Triangle to provide overflow employee parking for that venue. Several people spoke to this issue, including the Pastor of the church, Moses Camacho and the minister from the adjacent United Methodist Church, Reverend Julie Elkins, whose church is diminishing and could close down if it looses members due to parking and traffic problems. The discussion went on and on and it looked like Fitzpatrick and McCarthy were going to pull the plug on this request, but when the vote was taken it ended up 3-2, with Fitzpatrick and McCarthy voting NO, at 12:10 a.m.! Public Hearing #4 is the three-unit development on a skinny little lot on Viola Place. After a half hour of discussion the commission voted 5-0 to approve the project at 12:40 am. The final item on the agenda, Public Hearing #5, was a similar kind of development - 5-units on another skinny lot at 2661 Orange Avenue. The developer made an excellent, and rapid, presentation and - even though this fell under the Small Lot Ordinance and had variances - the commission voted, 5-0, to move the project forward. An exhausted commission adjourned the meeting to the January 12, 2015 meeting. "The result was that Sesler - also a lawyer - felt he could be an objective and fair participant and the commissioners agreed." Of course they all agree. Lawyers are so much better at being unbiased! I wonder how many billable hours will be charged for defending that move, even though a 4-0 vote, with him recused, would have accomplished their goal. No billable hours for Little Timmy on this one. He gets his monthly stipend - $400 - for December, regardless how many meetings they hold. 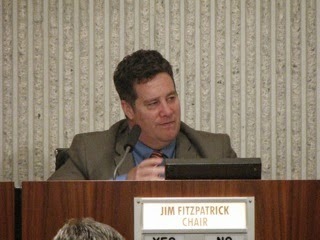 Still the highest compensated planning commission in the county! I was thinking of the billable hours for our defense by the contracted attorney, for the (guaranteed!) future lawsuit. 15 Adults in a 4 bedroom, 2 bathroom home! Oh my goodness. As this provides housing for persons with disabilities, I wonder if the 2237 square foot facility complies with all California and Federal ADA guidelines. @Teresa, they do not have to comply with ramps, handicapped etc...My question...ADA statues/decisions were initally established to open the door for those that are handicapped so that housing, accessibility, etc was available...NOW the pendulum has swung in the opposite direction and instead the able bodied are at the mercy of those deemed handicapped...alcohol abuse 23 million who should be in treatment, a truly revolving door to the bank and our communities. 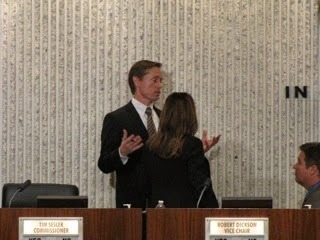 Costa Mesa Riviera Rehab..
Mensinger Mayor - Big Surprise! NOT!